Founded in 1946, Post 201 occupies 13 acres and exists to serve the country's war veterans. It is home to a memorial that pays tribute to U.S. veterans, family and friends through a walkway of almost 8,000 bricks inscribed with the names of Georgians who served in the Army, Navy, Marines, Air Force and Coast Guard. A collection of military equipment adds to this moving experience. Do you know someone who has served our country? Have them come to Alpharetta, GA, and step into a by-gone era flanked with true Americana to celebrate the heritage that allows us the freedoms we experience each and every day. Remember that freedom is never free. Gather the family for a visit to The Walk of Memories, located at our post. 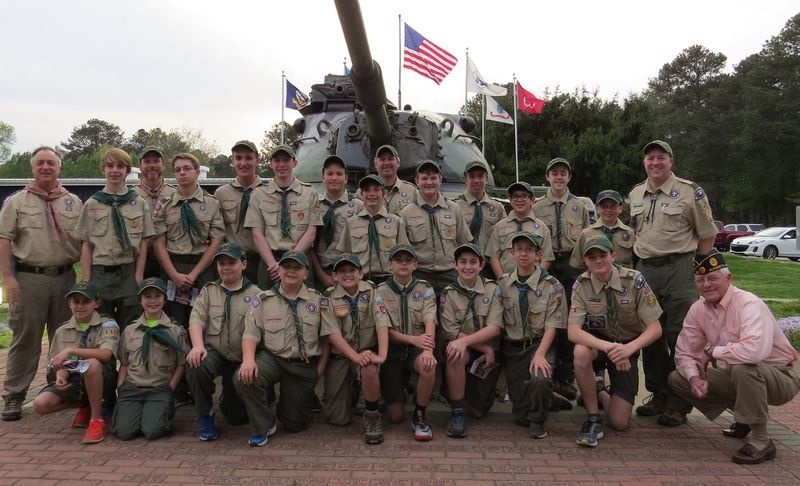 "Scouts of the Post's new Boy Scout Troop 51, their troop leaders and Post 201 project officer Ed Holben assemble in front of the tank at our Walk of Memories following their first meeting at their new home."